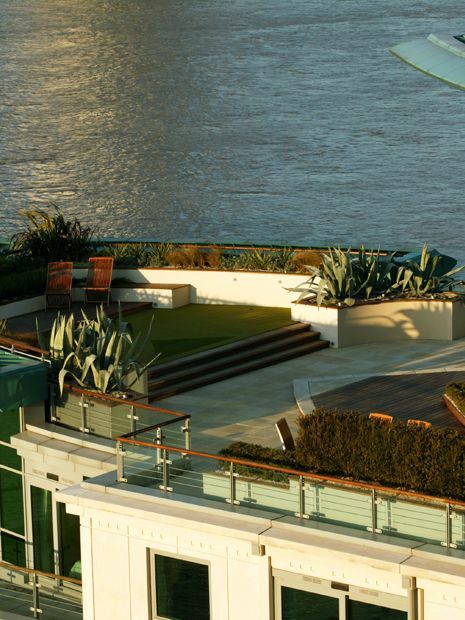 Take a look anywhere around Greater London, and there are myriads of rooftop terraces perched across its skyline as far as the eye can see. 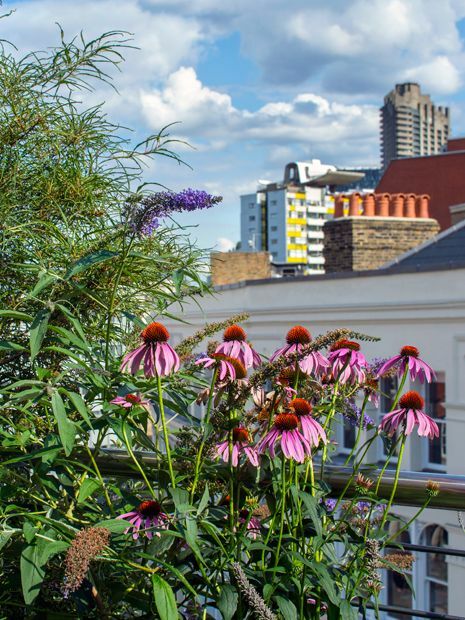 While many of us, roof terrace dwellers, face obnoxious pigeon antics, breezy aspects and logistic constraints on a daily basis, the merits of sky-high gardening, amid arresting city panoramas, remain unrivalled. Yet, how do we maintain such lofty terrace design ideas sustainably, and form wholly gratifying, liveable outdoor upkeep? The distinct ideas which foster roof terrace building blocks pertain fundamentally to an ongoing redefinition of housing density and the impact of its prospective outcome. Roof terrace design, ideology and style meld every urban narrative to encompass lucid, fiercely citified skyward ways of life. 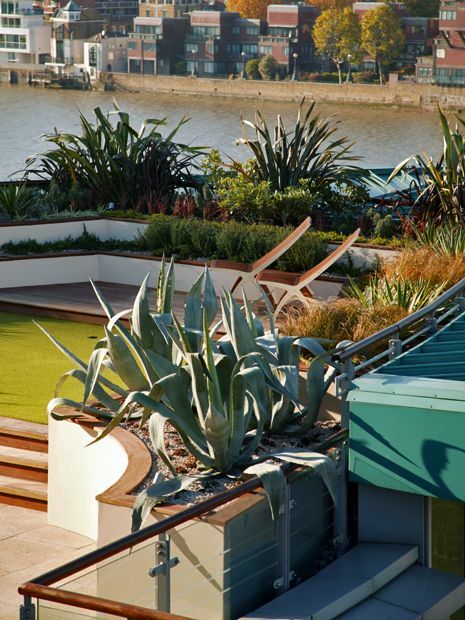 With 15 stunning London locations, 5 acclaimed photographers and 1 abundant roof terrace punditry by yours truly, we guide you through the ideas behind our rooftop projects, their essence and central methodologies. 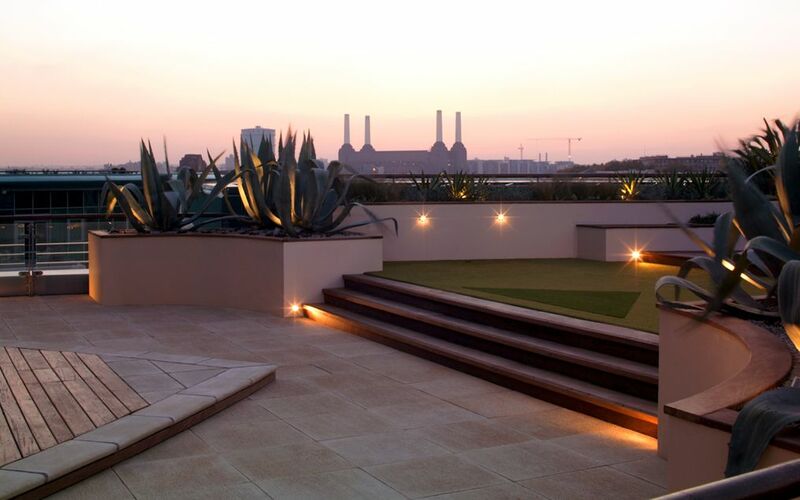 A well-integrated planting scheme enhances a roof terrace panorama abundant in famous city landmarks, but, when the view is lacklustre, obscured by dense surroundings, its natural verdancy redefines this setting immeasurably. The trichotomy of everyday urban life, green environment and balanced sustenance hovers in sheer incongruity over our pertinent, albeit naive leafy creations, and although many roof terrace owners shy away from seemingly taxing greeneries, the core which epitomises plants' validity is relatively simple to achieve. 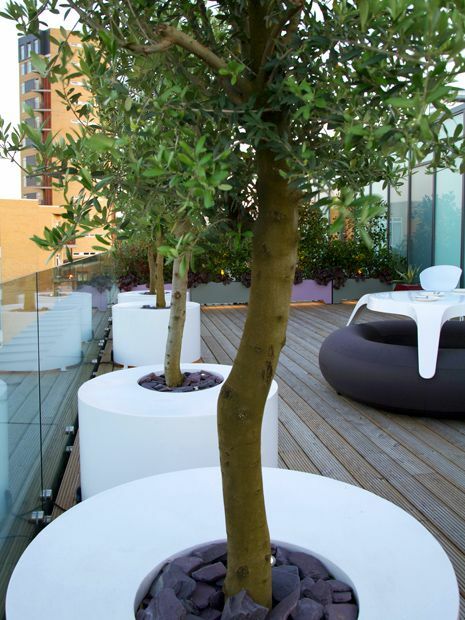 Whether culinary, wildlife friendly, Mediterranean, subtropical, or eclectically ornamental, the floras we utilise to delineate pivotal outdoor well-being benefit countless roof terrace gardens, and mellow gracefully within increasingly low upkeep ideologies. 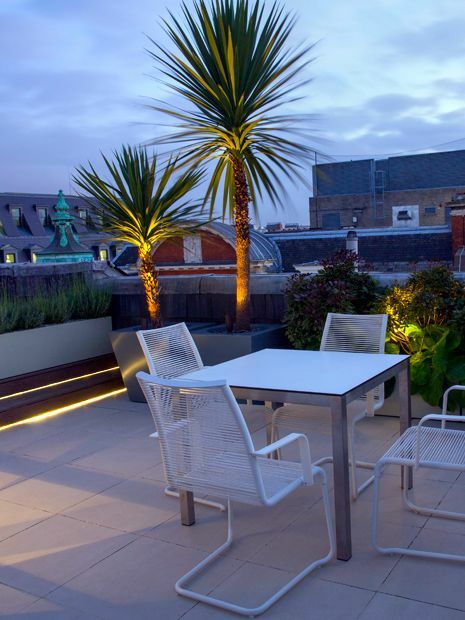 An ideal view defines one of the most personal aspects for avid roof terrace punters, and at times forms the be-all and end-all prospect in a resurgent skyscraping sprawl. Ingrained notions of up-close urban vistas within arm's reach, served a la carte so to speak, are nowadays welcomed with unprecedented high-rise developments in and around River Thames, yet synchronously, so do decline roof terrace numbers, condensed into miniature inadequate balconies. Similarly to maturing planting designs which evolve dynamic nuances every day, London's skyline unfolds transitional aerial views in each new architectonic city cluster. 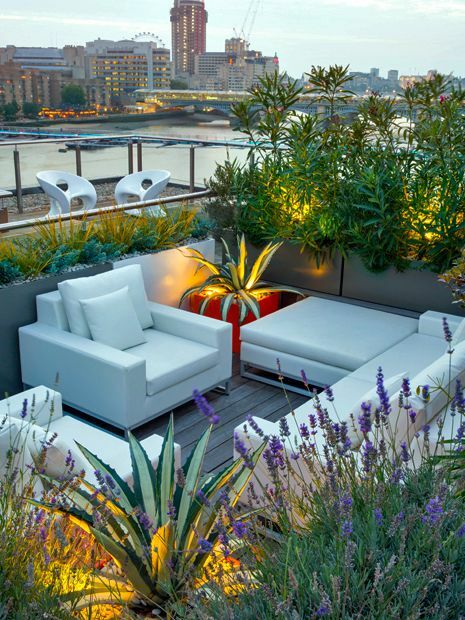 The capital's futurescape has been accelerating beneath and above our landscape, where in every roof terrace bird's-eye view, we embrace progressively more challenging rooftop garden designs. 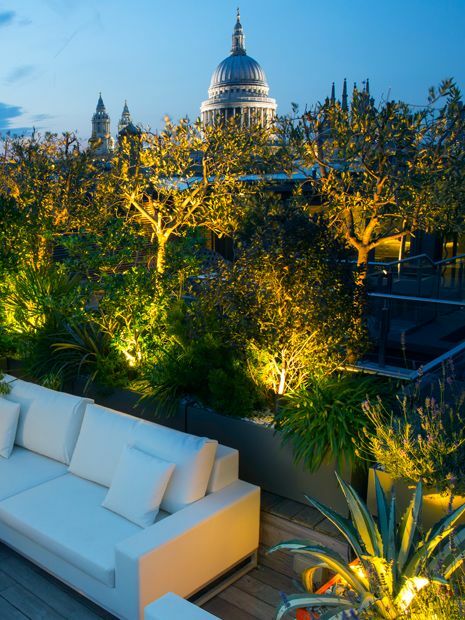 Roof terrace magnetism allures Londoners in their droves with bird's-eye perspectives and liberating spatial autonomy, where the capital's emergent roofscapes unveil iconic landmarks, breathtaking views and spectacular sunsets – nestled within a gripping matrix of memorable, familiar settings. This upturned urban landscape not only redefines perceptions of an inner-city style of living, but also fervently propels the multitudes which flock to soak up soaring eateries' ambiences, rooftop cocktail bars and sky-high tropical atria. 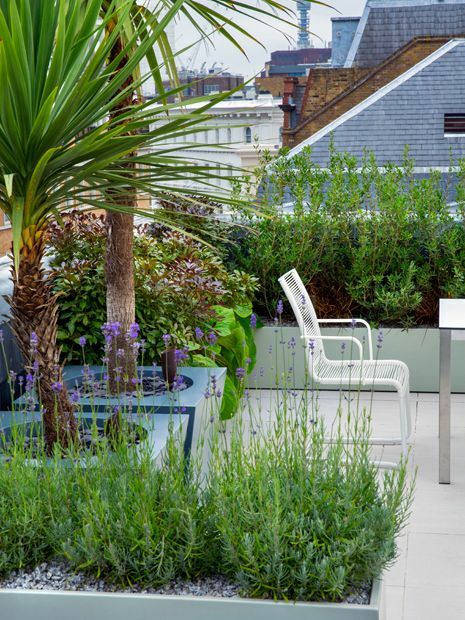 In our own humble roof terrace abodes, we seek to recreate such lofty open-air pursuits, where alfresco dining, carefree sunbathing and ironically windblown horticulture coalesce to form urbanised ideals – expressed in utter disparity to those firmly rooted in tellurian outdoor activities. 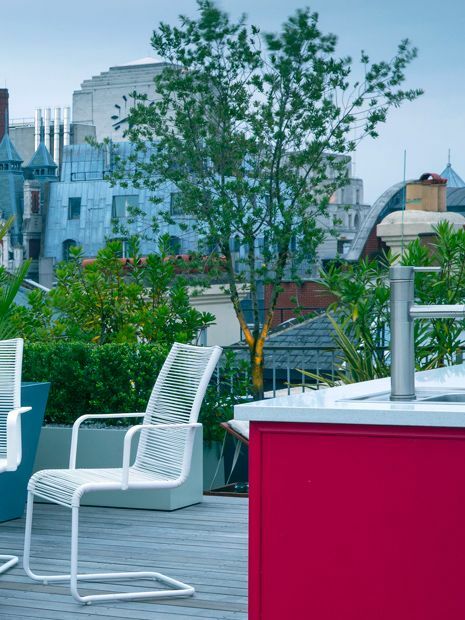 The roof terrace ideas which nurture these aspirational skyward settings evolve through indispensable experimentation, architectural design and a profound connection to London's historic fabric. 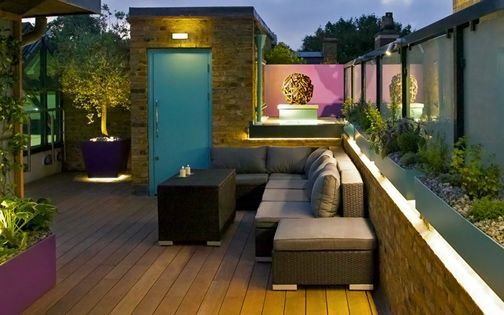 Devising the most apt format for roof terrace seating zones forms a somewhat tricky design conundrum, when windswept environments, undermined by myriads of onlooking crowds and lack of easy shelter, necessitate durable, functional solutions. 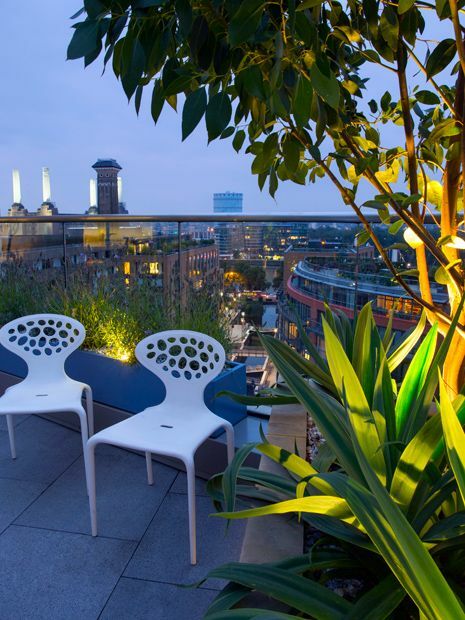 Our rooftop seating ideas invariably revolve around inherent valuable vistas which we aim to preserve, and lead a roof terrace design sequence towards. Intense sunbeams, incessant noise, relentless pollution and continual rainfall affect how we choose to rest ourselves amid the urban hustle and bustle to define a more tranquil, personal outdoor expression which compels an aesthetic, homogeneous presentation nonetheless. 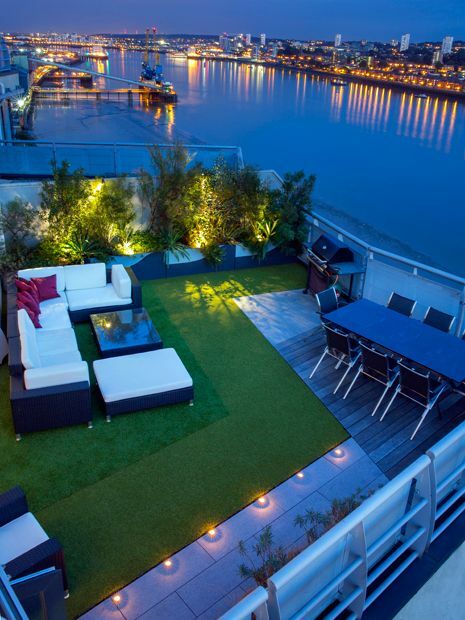 With London's numerous new-build developments rising staggeringly higher across its length and breadth, the shadier our rooftop terraces become, and all too often, quite astonishingly, fitted by short-sighted planners without essential water supplies! 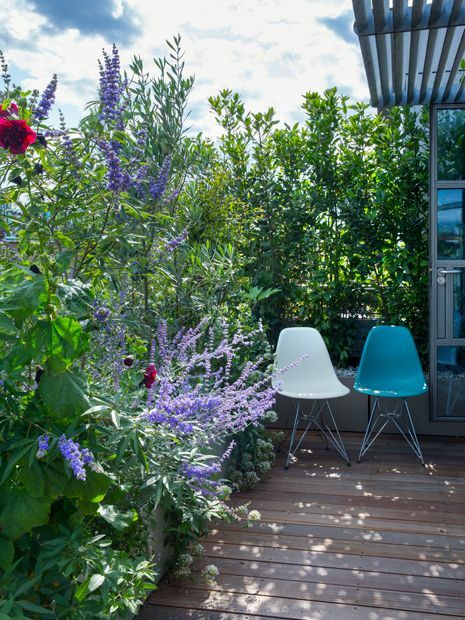 For a roof terrace seating area to flourish, and form a homely hub, we require some blue-sky thinking, delineated with abundant foliage fusion, ergonomic prowess, and above all, a representation of its owners' personality and home. 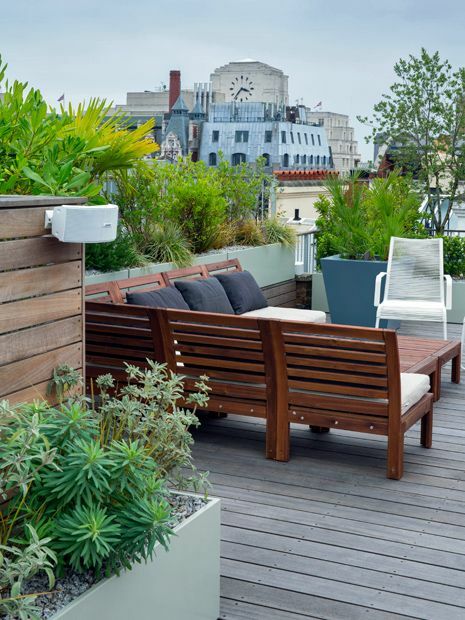 Roof terrace ideas, inspiringly, are everywhere, and comfort design adeptness intently conveys outdoor relief among breezy rooftops. 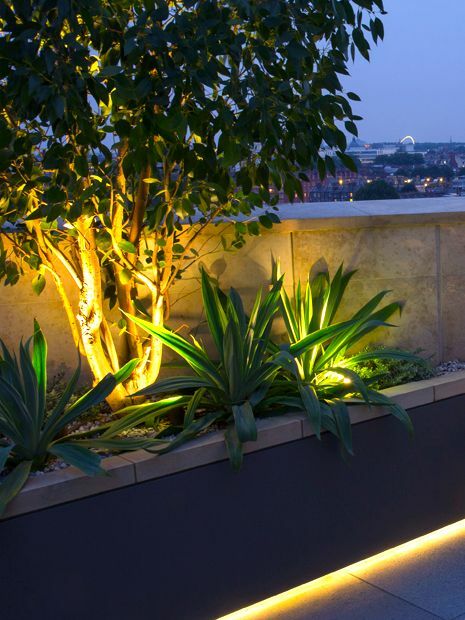 Outdoor lighting forms one of the most rewarding, functional and aesthetically pleasing aspects of a well-designed garden landscape, and likewise, in a roof terrace, enveloped panoramically by city lights, its role is amplified immensely, where we go to town with our lighting to facilitate cohesive and immersive roof terrace landscape designs. 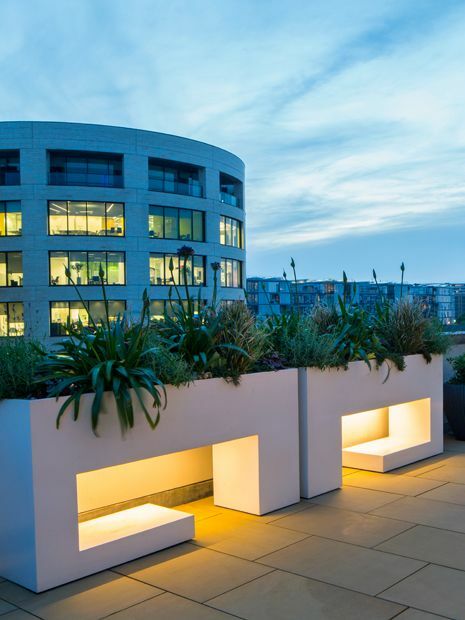 London's diverse architectural milieu, through its eclectic multilayered scale, sustains timeless patterns and light sources 24/7/365, which we methodically and sympathetically tap into – producing energising roof terrace concepts. 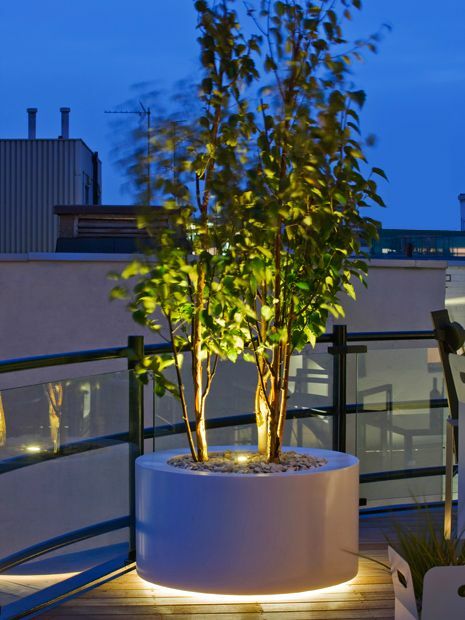 Each sightline, vista, cavity and sculptural tree trunk opens up a whole new lighting idea box, from which we reinvent the setting completely and redirect flow, enhancing night-time ambience. 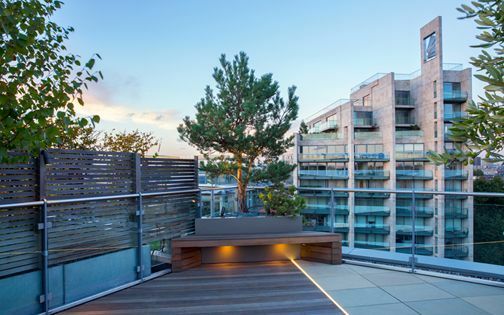 The definitive afterglow of a well-lit city roof terrace, its thoughtful positioning, artistic finesse and state-of-the-art circuitry, generate metropolitan seductiveness like no other outdoor space genre can. Contemporary rooftop culture, across its varied scales, preserves the idea of an effortless lifestyle, augmented by self-watering systems and clean-lined conceptualised layouts amid alluring panoramas – inextricably linked to lesser maintenance and maximum exuberance. Yet, while many social housing high-rises stand hazardous, and a St George Wharf Tower 5-storey penthouse fetches 50 million coins of the realm, we remain transfixed with the cavernous spectrum which defines urban roofline summiting. The derivation of such fantastical terrace ideas originates to Kensington Roof Gardens, above Derry & Toms department store in the 1930's, and nearly a century on, when London's population growth is estimated at one percent per annum, it's no surprise hordes of inhabitants either explore subterraneanly, excavating vast basements, or levitate skywardly to emancipate some outdoor breathing space with green roof terraces to boot. While urban planners invariably succumb to the lucrative merits of crowdedly clustered London skylines, we, mere townies, continue to journey en masse to soaring prospects all around the capital, amid constant pollution, noise, wind and fewer privacy probabilities. 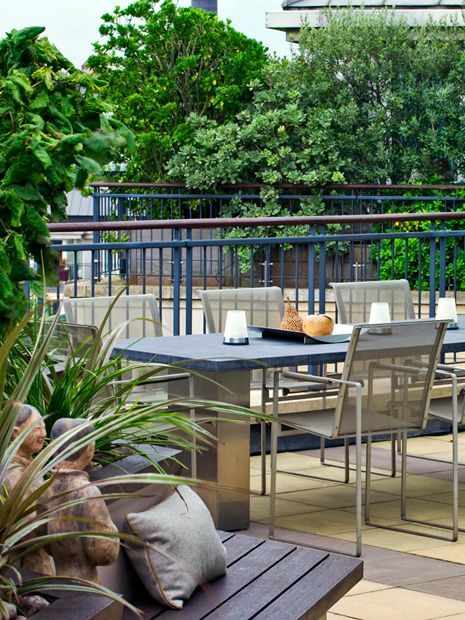 Still, an urban, high-altitude roof terrace, with its commanding views and sense of refuge, instils perceptions of capability and metropolitan grasp, immersed in robust optimism within paramount verdancy. 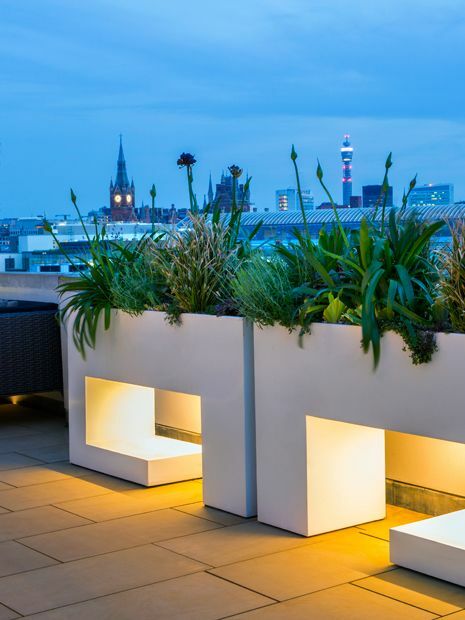 Not much seems to surpass unique, one-off planter designs to stamp roof terrace individuality and sustain vigorous, thriving plant life – as connective interlayers, immanently evocative of their city backdrops. 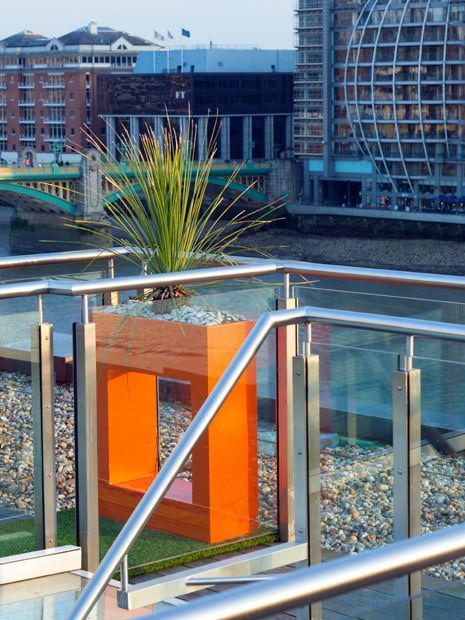 The ideas for our bespoke roof terrace planters evolve while studying a new site's inherent architectural elements, structural capacities and its owners' stylistic penchants to form distinctive, robust focal points. 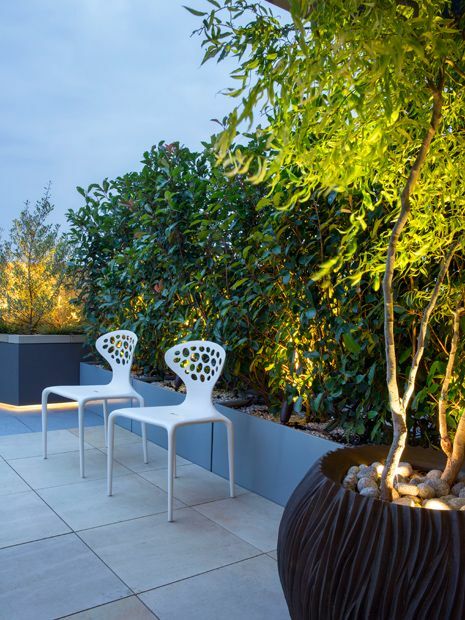 Originating such terrace design ideas requires efficient planning, firm logistic awareness and scrupulously detailed designs, in combination with diverse colours, surface finishes, integrated irrigation, drainage and lighting. 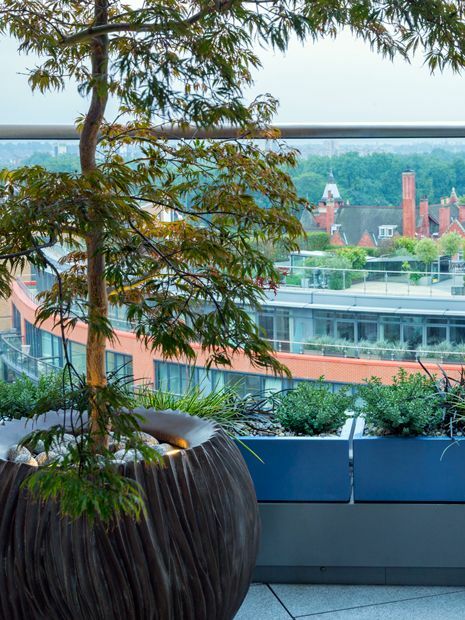 Yet, even when we've created seamless engineering, and masterminded fully customised terrace centrepieces, the likelihood of misjudging potent wind factors can be disadvantaging to top-heavy flora in certain rooftop locations. 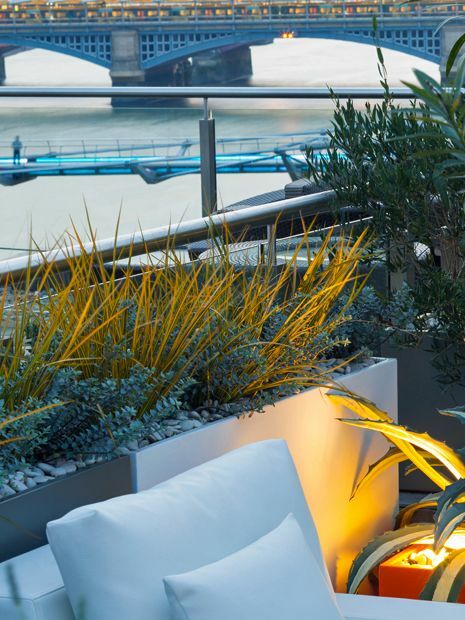 We therefore continually develop constructional methods to enhance planting stability, and guide our clients through suitable roof terrace maintenance to extend both the plants' and their vessels' rooftop longevity. 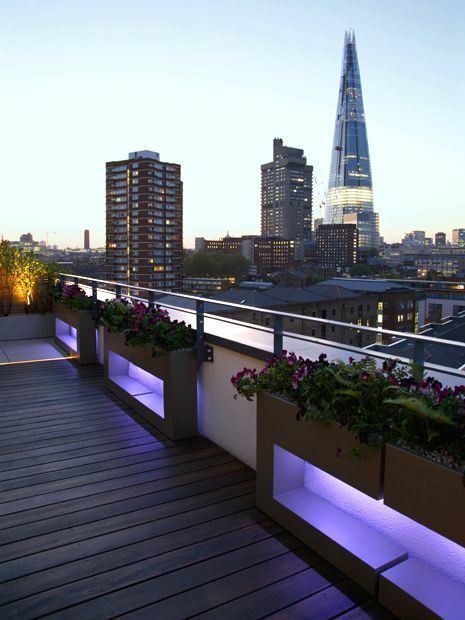 The range of materials we utilise to surface a roof terrace is vast, and while implemented predominantly within suspended systems, we're able to make good use of its integral capacity to conceal the bare bones of rooftop frameworks. 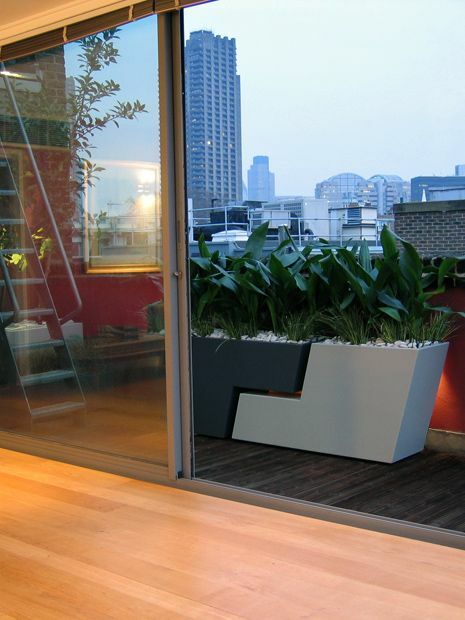 With inbuilt roof drainage slopes, we construct perfectly levelled surfaces, assembled onto adjustable pedestals, and present fluid indoor-outdoor sequences – augmented by load-bearing suitability, alongside free draining functionality. 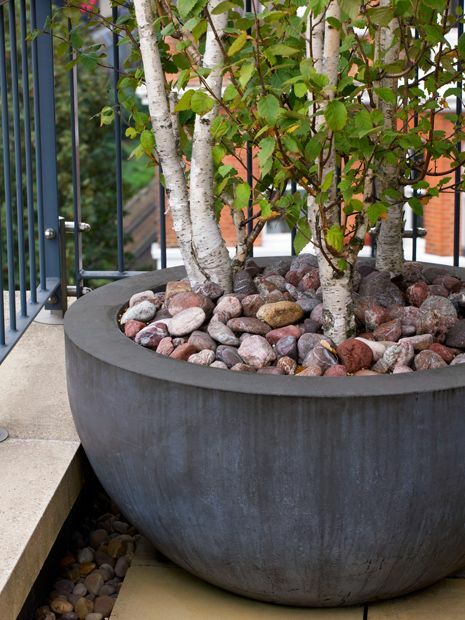 We frequently integrate an abundance of natural stones, including basalt, granite and sandstone, as well as porcelain and concrete pavers, for their adaptability, durability and strength, while logistically conducive to easy hauling into roof terrace locations via conventional methods. When specifying wood materials, deck components or artificial grass, particularly in oversized lengths, a furniture lift is typically required to transport items up to seventh floor height, and a mobile crane for greater elevations. 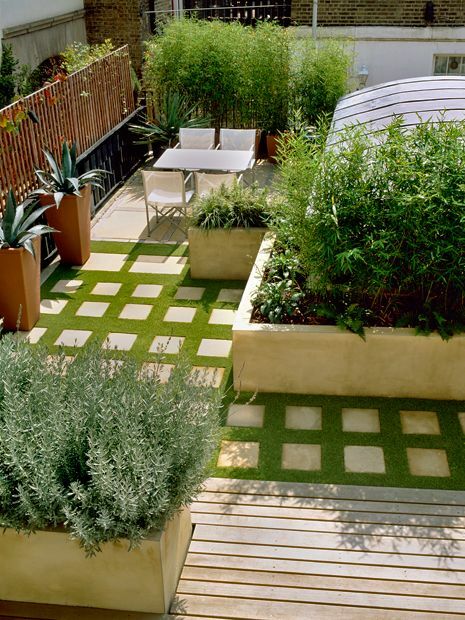 Well-thought-out roof terrace ideas accommodate complex logistic constraints at a project's outset, when we inherently brainstorm surface viability as the foundation of an epitomic triad of materials which underpins a roof terrace's bold canvas: apt exterior flooring, spacious planters and luxuriant plant palettes. Since New York's population density eclipses London's five times over, we're a long way off from a gardenless urban reality, and while architects Sir Terry Farrell and Renzo Piano continue their turbulent debate concerning our city's future fabric and its skyline density, the capital's land developments advance towards great blue yonder at a meteoric acceleration. With a mere half-century between Chicago's first skyscraper inauguration and London's multi-storey counterpart, we're firmly en route for a blanket, silhouetted horizon comprising fragmented, glazed clusters of greenless steel cages. In the interim, property developers rise to presidencies, and scrape away at will bits of valued sky – overshadowing vital ecologies and their heritage. 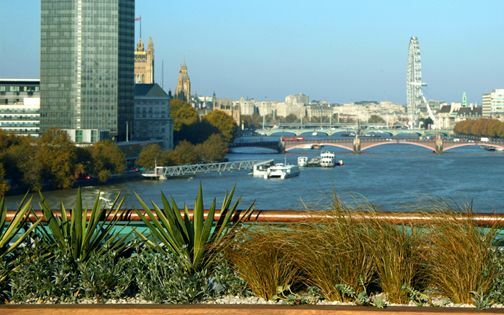 Heatherwick Studio's Garden Bridge had hoped to be London's most spectacular, environmental roof garden in the heart of River Thames, but as so many rooftop constructions prove to be, this project was scrapped, since estimated costs quadrupled over the course of two years. 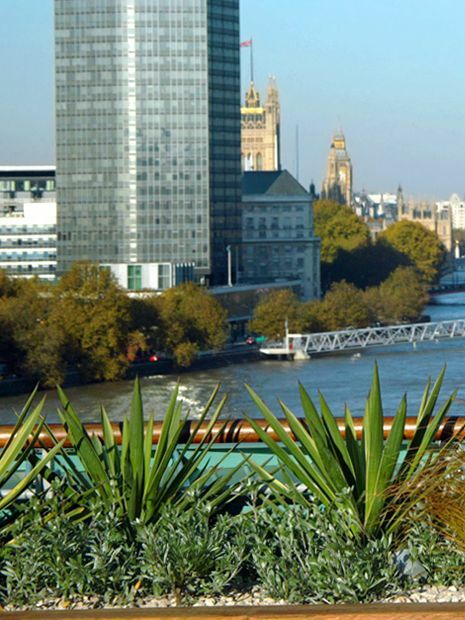 Still, the Garden Bridge Trust's loss entails a hefty price to us Londoners too, when rooftop terrace globetrotting reaches unfeasible price tags, and depicts a bleak barren landscape devoid of breathing space, sustainable ecologies and a sense of community. 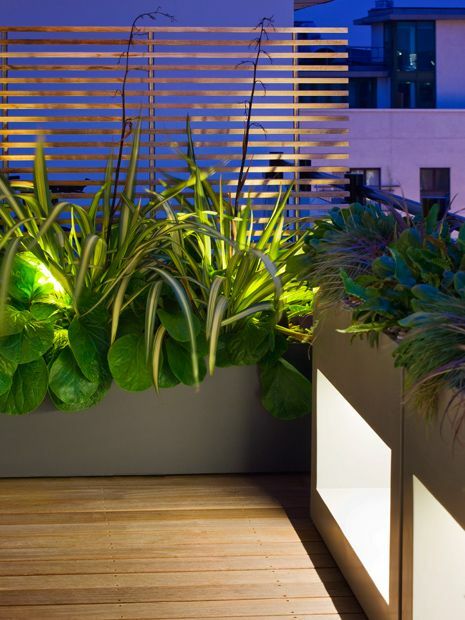 Purposefully designed, efficient roof terrace projects endorse green terrace design ideas, individual well-being and architectural integration proactively, and should continue to define, and reinvent, urban biodiversity. London's skyline anatomy, chock-full of blinding glass, outlines an embryonic carbon copy of taller megalopolises worldwide, albeit its architectural eclecticism remains a redeeming standout feature. Roof terrace design softens all-out brazen architecture, and encapsulates a uniquely broad scope, fostering diverse landscape practices, city-bred living ideas and sustainable terrace concepts as an all-encompassing, multidisciplinary, charismatic profession. The robust roof frameworks we fabricate to delineate such profound design philosophy support a tremendous array of versatile techniques, assembled to form resilient landscapes which merge with an ever-changing, buoyant urbanscape and its compositional make-up captivatingly and contextually. 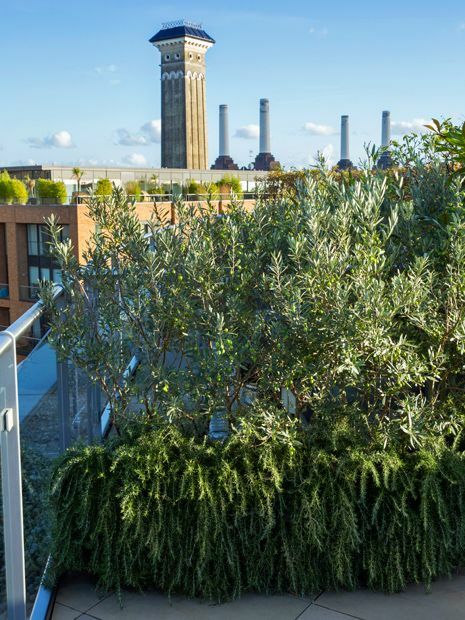 From London Fields to Chelsea, and Highgate to Wandsworth Town, the capital's emerging altitudinous rooftop topography involves not only urban savvy, engineering nous and design inventiveness, but also a forward-looking approach to preserve heritage, and produce a long-lasting legacy. The kaleidoscopic anthology generated by hardscape and softscape innovation, intricately juxtaposed amid a modern-day river cityscape, positions the craft of rooftop design at the acme of urban specialisation – constructing memorable aerial landscapes alongside intimate outdoor spaces and well-fitted frameworks. The polarity between designers' cynically stylised whims and urban authenticity is persistently exacerbated into a divisive blurry skyglow, while supported indiscriminately by gargantuan bling architecture – sponsored and triumphed within insular, short-term civic strategies. 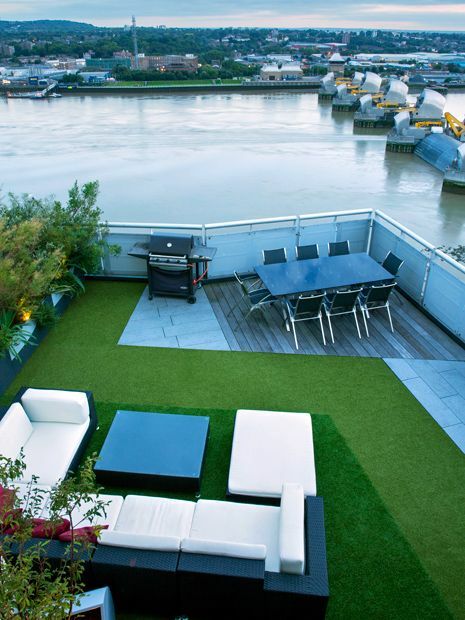 Meanwhile, unfeigned roof terrace design enterprises are curtailed to mere culture connoisseurs, or disappear altogether, when overly built-up, streamlined clusters citywide, devoid of environmentally-friendly systems, produce austere, dehumanised structures. How does awe-inspiring, pioneering planning survive, and mitigate this gap with a congruous continuum of interconnected, verdant rooftop gardens? Perspectival, proportionate, mid-rise layering articulates diversified balanced scale, and sensibly puts ecological and residential rooftop design ideas into better integrated practice. Moshe Safdie's 38-storey Singapore Sky Habitat resolves such urban conundrums meaningfully, where architect Safdie states that “skyscrapers create disjointed and disconnected cities”. Structural building frameworks remain principally underused as abstract ideas in an unwavering diversity paradigm. 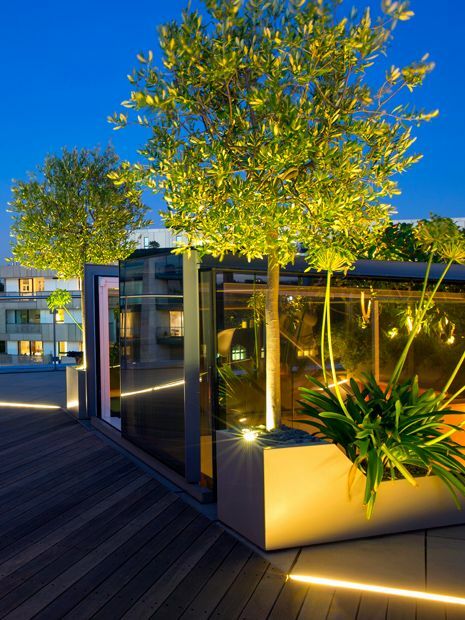 The knack, seems to be, is to fuse cutting-edge designs and technologies with individualised roof terrace hideaways to form a comprehensive, multifaceted, vitalising synthesis. 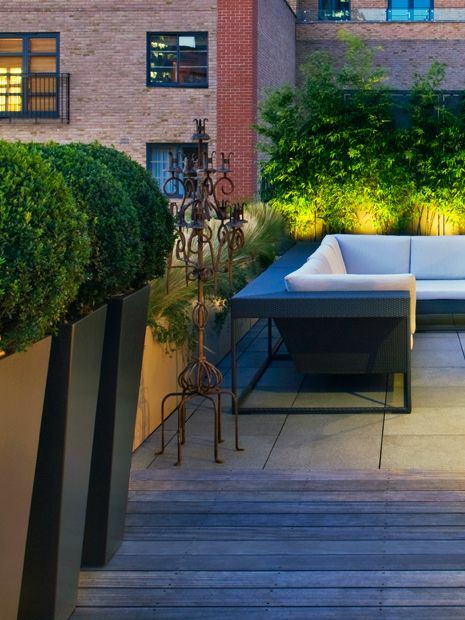 Roof terraces' remarkable metropolitan essence pivotally sustains resourceful urban design methodologies, while continually revitalising London as we know it. 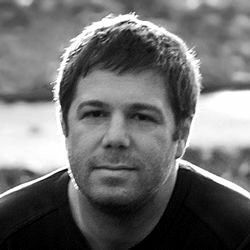 Yet, the profession's durability is undermined by extraneous ideologies which affect its exploratory design process, when a pervasive architectural dichotomy asserts parallel discourses, poignantly exemplified in the gloomy irony of abandoned horizontal green roof projects and velocity of vertical glazed ventures. 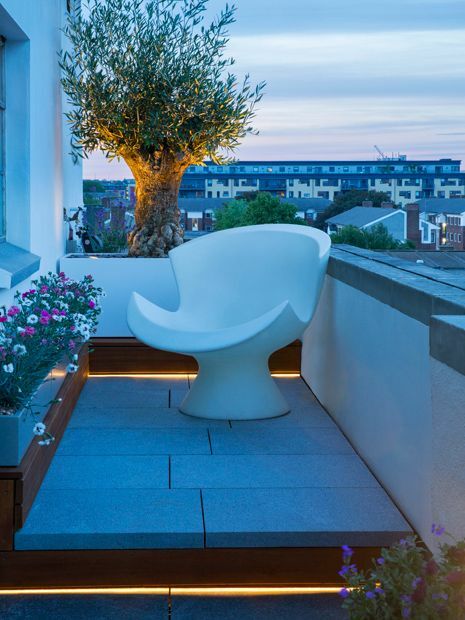 The very nucleus of roof terrace ideas nurtures constructional substance with design flair, alongside custom-built outdoor solutions which define, and maintain, vital, enduring and inseparable urban landscapes.